The Ford C-MAX Hybrid is part of Ford’s hybrid-only line of vehicles. The C-MAX features design elements in line with ford’s ‘Kinetic Design’ language, including trapezoidal grilles, large wheel arches, and angular headlights. Technically it’s a wagon, but appears more like today’s popular crossovers. The first C-MAX was introduced to the European market in 2003, and a hybrid version was eventually unveiled at the 2011 North American International Auto Show in Detroit. In September 2012 the car was released in the United States as a 2013 model year. Ford designed the C-MAX Hybrid to replace the Ford Escape Hybrid and the Mercury Mariner Hybrid as a 5-seat hybrid vehicle with a hatchback, allowing for cargo space. 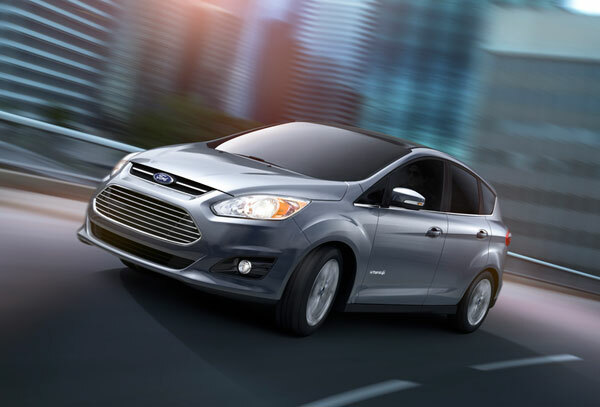 Ford developed the C-MAX Hybrid with the intent for it to become the most affordable hybrid utility vehicle in America. At a 45 mpg fuel rating, the C-MAX beats out its rival, the Toyota Prius, by 3 mpg. Ford also announced in 2013 that it would be offering software updates to increase the on-road efficiency of its hybrid models. The upgrade was offered free-of-charge to help improve customer satisfaction. The C-MAX received much criticism about the original 47 mpg fuel rating as consumers claimed worse-than-expected real world fuel economy. Ford faced lawsuits and in August 2013, voluntarily lowered the EPA ratings to the current 43 mpg rating, and issued customer rebates.